Hosts Solomon Islands opened their campaign with a 5-0 win over Papua New Guinea in front of an expected huge crowd in the day’s later kick-off. 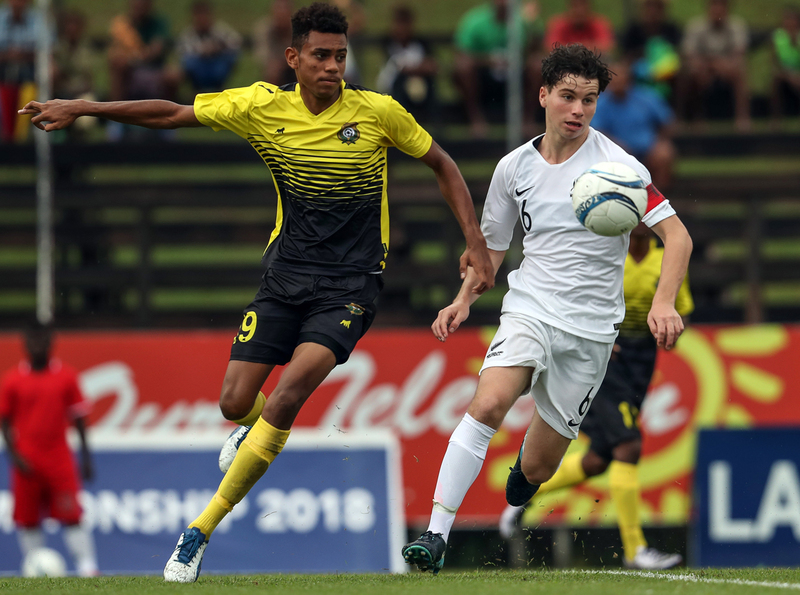 The breakthrough for Solomon Islands still arrived pretty early on as Raphael Le’ai marked his birthday with a perfect gift – the opening goal of the tournament for Solomon Islands and his first as an international footballer. Despite the downpour in the later stages of the second half Chris Satu and Le’ai managed to score as the hosts walked away with a 5-0 win over their Melanesian neighbors. Waita congratulated Le’ai for his five-star performance to mark an auspicious occasion. “As expected Raphael has done extremely well today, I told him in the dressing room that today is his birthday and he need to do something to give him a birthday present. “So today, he did what we wanted”, Waita added. In the day’s early match Vanuatu struggled to settle into the pace set by New Zealand nor were they particularly comfortable with the Lawson Tama surface when wet. Oskar Van Hattum struck twice in the second half – the first from the spot before an impressive 76thminute free kick, before substitute Joseph Lee closed out the day’s work with a goal in added time. New Zealand coach Josè Figueira was happy with the win in the side’s first international hit-out. “I think the pitch suited the way we want to play which allowed us to move the ball around and resulted in us getting couple of goals against a really organised Vanuatu early on,” Figueira said. “The rain with the cool weather conditions really suited us and boosted our confidence and we are delighted for our win. “We are really happy to be here a few days but it is always difficult getting used to the surroundings and also a new experience for the boys but I am delighted with the personality shown by the players to dominate the game which is a great start for us,” he concluded. “We were expecting the boys to perform the way we planned but the boys found it a bit difficult against the defending champion,” Rarua explained.